Time versus money. Few of us are fortunate enough to have both in plentiful supply. Some of us have more of one than the other. And a lot of folks have neither. When you start planning your restoration project you’ll most likely be affected by one or both of these limitations. In my case, sufficient money is there to buy parts and materials but I don’t think I could contemplate paying someone else by the hour to perform the work. And I also find performing the work required very therapeutic for me in the limited time I have when I home from work and need to relax. So I am trading my time(free labor, basically) for someone else’s labor. Another factor is the final value of the restored car. 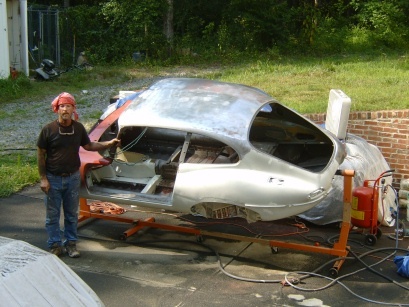 Frankly, a 1967 E-type 2+2 will only bring so much money no matter how well the restoration is performed. In my case, with the extremely rusty condition that the car was in, it would not have come even close to being a sound financial decision to pay someone else to do the necessary work. So I feel good knowing that if it were not for my efforts, this one may have been sent to the crusher. Rust has not been kind to my car and I started out with a lot of holes needing to be filled in. But in this regard at least, I can see the light at the end of the tunnel. 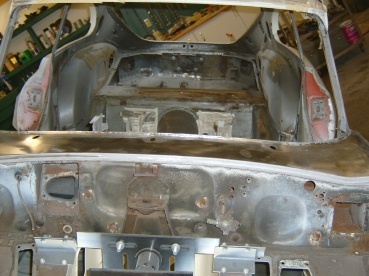 New floorboards are welded in on both sides of the passenger compartment. At the rear, a new boot floor is welded in. Around the sills and wheel wheels, new sheet metal pieces have been cut, shaped, and fit. The mounting points for the rear suspension, which had me in a much more precarious position than I realized at the time of my one and only test drive, are repaired. And on and on the list goes. I was careful to prime and paint the inner sides of the pieces I patched in with spray can enamel, as they would be rendered inaccessible once installed. Conversely, I decided not to stop and paint the exterior pieces, as the mixing and application of the necessary epoxy primer with proper prep work was quite onerous as an ending to each weekends work. Fortunately, I found that keeping the dehumidifier on in my shop kept rust formation at bay. As we will discus later, I ultimately prepped the entire exterior to a highly cleaned condition and then applied the epoxy primer. So as far as my experience has shown, the dehumidifier and a protected shop environment are sufficient to avoid interim rust formation as the bodywork proceeds, which in may case involved many months. 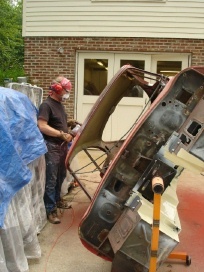 Once the obvious panel replacement and welding were done, my thoughts turned to applying paint to the bottom and the inside of the bodyshell. Both surfaces would be painted the same color as the exterior, as was done originally. But first I had several other welding projects that I wanted to finish. I have always been a big proponent of seat belts and that means a lap belt and a shoulder belt. I’m not quite sure when shoulder belts were introduced to the E-type but suffice it to say that they did not appear to have been installed on my car. Even worse, the shoulder belt of that era would be fixed length with no retractor mechanism. At XK’s Unlimited (one of our advertisers) I found a set of new belts with retractable shoulder belts that the salesman said would fit my E-type. True enough I guess, if the car had left the factory with mounting points. Mine hadn’t so I had some work to do. Using the mounting points that did exist for the original lap belts, I located suitable locations on the rear wheel well arch for the upper mounting point of the shoulder belt. I then proceeded to reinforce my selected spot with multiple layers of sheet steel and finally placed a captive nut behind the whole assembly. I do some structural engineering as part of my work and think it will hold. I guess if it doesn’t, my heirs can sue me! Another safety issue that had me worried is that of headrests for the seats. I had watched a program on TV where they showed the effects on crash test dummies of being rear ended without headrests. It pretty much scared the daylights out of me. So I did a little research and found that a few years after my car was built, headrests were introduced to the E-type. Even better, the Series 3 car had a seatback that reclined. Perfect! I contacted Stephan Roundy, a well know “re-cycler” of Jaguar parts and he was able to ship me two fairly decent seats from a Series 3 car. Unfortunately, the mounting pattern for the seat frame on the floor was different so I had to cut out and re-weld the mounting points. Not too bad of a job if you’ve got the right equipment. So yes, Kelli my dear wife, buying that MIG welder just may save my life someday!! 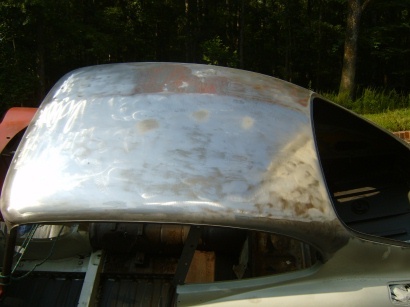 After a few other minor repairs, it looked like welding on the body shell was complete. What lay in store next turned out to be a weekend in my life that I don’t really want to repeat too soon. I decided to move the car out as far away from the garage as I could, on its rotiserrie, and proceed to prep the underbody for paint. What a horrible job! Let me tell you, there is no easy way to remove 40 years of undercoating, tar, and road grime. I resorted to a routine that started with an attack with an 8″ wire wheel attached to a 10 pound electric grinder that starts to feel like 50 pounds after you’ve held it up for a few minutes. And it flings black debris everywhere. I soon looked like a coal miner. The grinder will get about 90% of the thickness off but can’t finish the job. Next up was a Roloc wheel mounted to my air tool. Much lighter and easier to maneuver. It probably would have done the work that the wire wheel did, only much slower. Finally came the sandblaster. I had purchased a pressure pot blaster from Northern. You will need a very large compressor to run one of these. I buy blasting sand in Raleigh from Capitol Lumber of all places. They have various grit sizes. Get the smallest they have, as the larger sizes tend to clog the nozzle, which is very aggravating. It took me two days to get the underbody really clean enough to paint. It was a 3 day weekend for me so on the third day I painted. I think I have explained in previous articles that the various layers of paint are applied in sequential layers with maximum time intervals allowed between coats. So in another marathon day, I applied epoxy primer, the color coat, and finally the clear coat. Its just the underside, so I didn’t need to perform any intermediate body filler or sanding steps. Finally, I was done and was grateful to go back to work the next day so I could rest up! 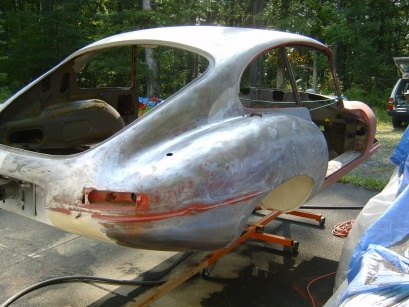 Next month we will get to final painting of the interior of the body shell.